Q. Thank you for supporting us! Can you tell us why you choose to do so? A. I heard about the sponsorship programme from a friend and decided because my own pets are rescues and have such a good life, I wanted to ‘pay the good fortune forward’ and support others who have not been so lucky. Q. Will you talk us through your day at the centre? A. On arrival at the centre, I was surprised at how big it was. Now that I know the number of rescues they deal with in this area, I understand why. Nothing less would do or enable the staff to cope with the volume of animal patients and guests! The staff are helpful, calm and reassuring. You can see as they circulate around the kennels and pods that the animals clearly know and trust them. It's very touching and emotional to see the bonds that have formed between animals, rescuers and carers. Q. What would you say was the best bit about your visit to our centre? A. During walkies with three of the dogs, we visited the ‘sensory garden’ and I was especially impressed with this facility! The area is well secured and has been cleverly designed to have sniffing, running and resting areas with lots of toys and obstacles. All the dogs were clearly excited and happy to be there! 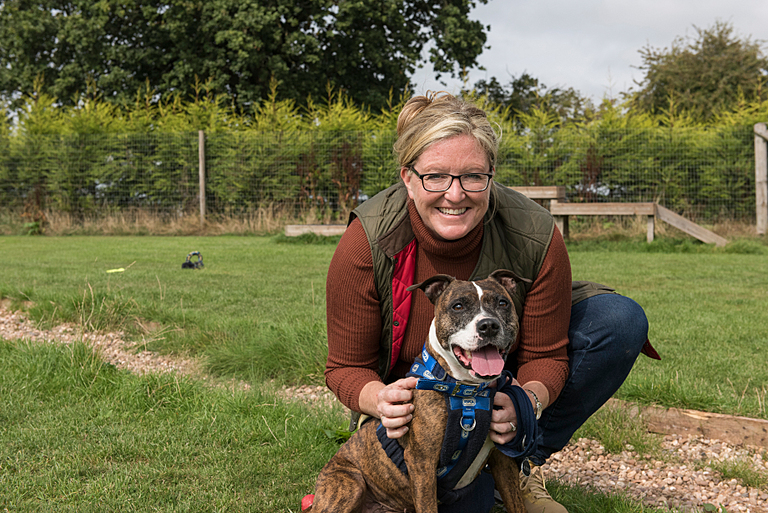 It was lovely to see dogs having the chance to ‘be a dog’, especially after the stressful journey they may have had en route before arriving at the RSPCA and living in kennels. Q. How did you feel after seeing your gift in action? A. At first, I was struck by the number of kennels and also the amount of work involved in cleaning and maintaining them. Clearly, a huge amount of thought and effort has gone in to make these kennels and pods as secure and comfortable as possible. Each dog kennel and cat pod was functional, yet customised with blankets and beds for the dogs and added extras for the cats like climbing structures, scratching poles and toys. It’s great to know that because of sponsors like me, these creature comforts can make a real difference in providing a more home-like, relaxed and enjoyable stay for animal guests. Q. So Michelle, how will you be spending Christmas Day this year? A. I will be at home with family and furry friends. It does make me think of the dogs that I met, and I hope that they will be in a home by then too with a loving family!